Today’s shot features the Lower Falls of the Grand Canyon of the Yellowstone River (I’ll feature a wider-angle shot of the canyon sometime soon). This spot was incredible – we were up at an overlook perched just over a corner of a bend in the river. Standing there and taking in the view was like watching the earth develop over a few thousand years. When we first arrived we actually saw a bear climbing down the right side of the valley – which was just insane. I can’t believe there is a creature on the planet that just saunters around terrain like that….it made it about halfway down the canyon before climbing back up towards the top of the cliff wall. The Lower Falls is the tallest (at 308 feet it’s almost twice as high as Niagara) with the largest volume waterfall in the Rocky Mountains. It was quite peaceful and mindblowing standing and taking it all in (along with 20 other photographers armed with ridiculously nice equipment). 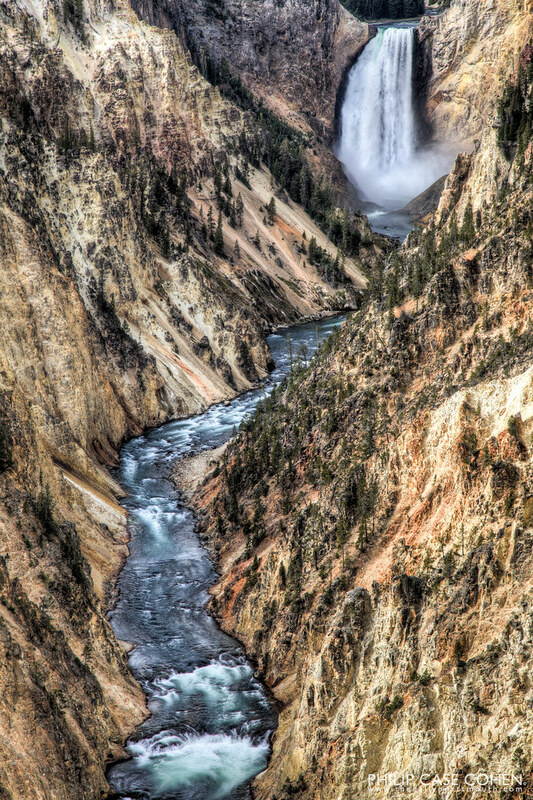 For a photographer, Yellowstone was really like being a kid in a candy store. 44 years ago on our honeymoon I took pictures from here with my 500C Hasselblad. I DO NOT LIKE HEIGHTS. However, my wife darted under the water pipe railing and dashed to the brink of disaster to retrieve a nice yellow (Yellowstone) rock for her collection. Think: Lucy in “The Long, Long, Trailer”. Hi Daryl – thanks for visiting the site and sharing your story. I’ll bet you got some phenomenal shots with the 500C – I’ve just started using my uncles 500c that I’m very excited about!